Greetings and salutations, everyone; yes, once again it is I, Mani the moderately-sized purebred border collie, filling in for the guy I live with, and here to bring you the latest news from our garden, after a very frightening evening yesterday. You may remember me from such posts as “The Upended Breakfast”, among so many, many others. Here I am in a characteristic pose, after my first Halloween. The guy I live with was explaining to me that Halloween only comes once a year. I wasn’t really sure. Last night, there were tiny skeletons and witches at my front door, and even though I was warned that this might happen, I guess I had to see it for myself. And it was true. And really scary. 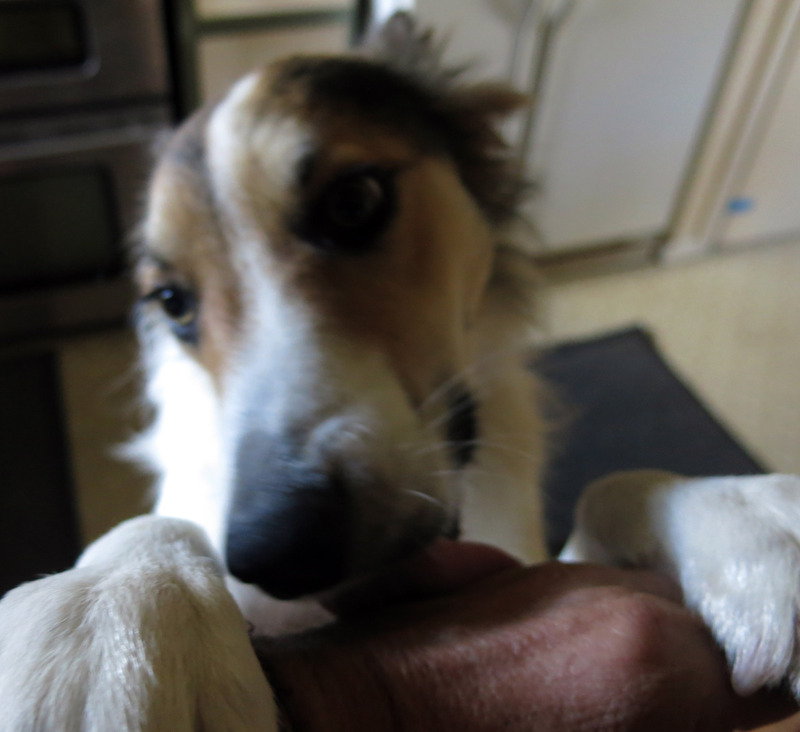 Later in the evening, after all the trick-or-treaters had gone, I felt I needed to lick the guy I live with’s hand, since I was so upset, though of course it wasn’t really his fault that all of this happened. 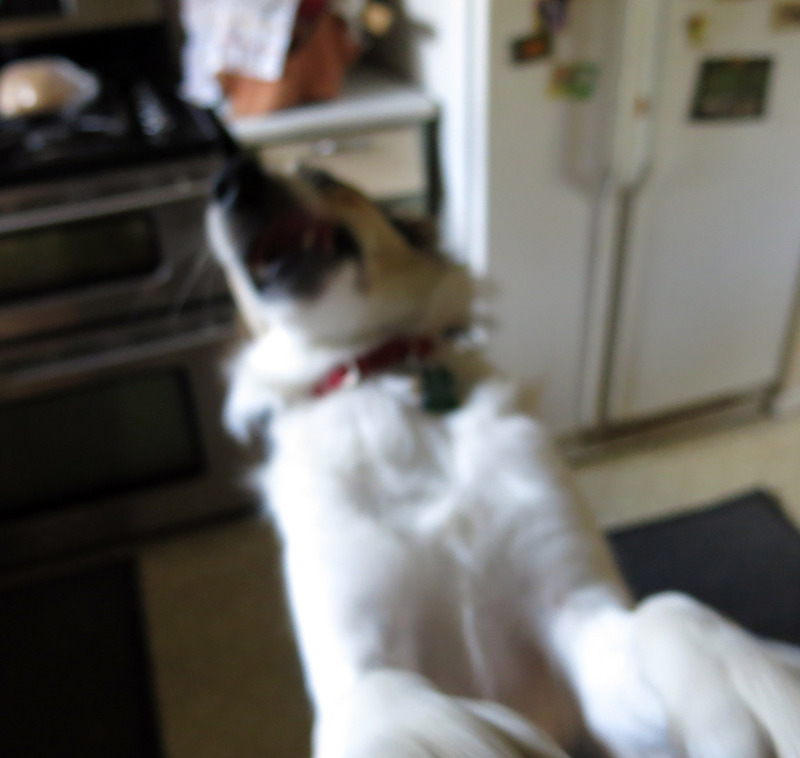 I know these pictures aren’t in focus much, or even at all, but I was moving fast. 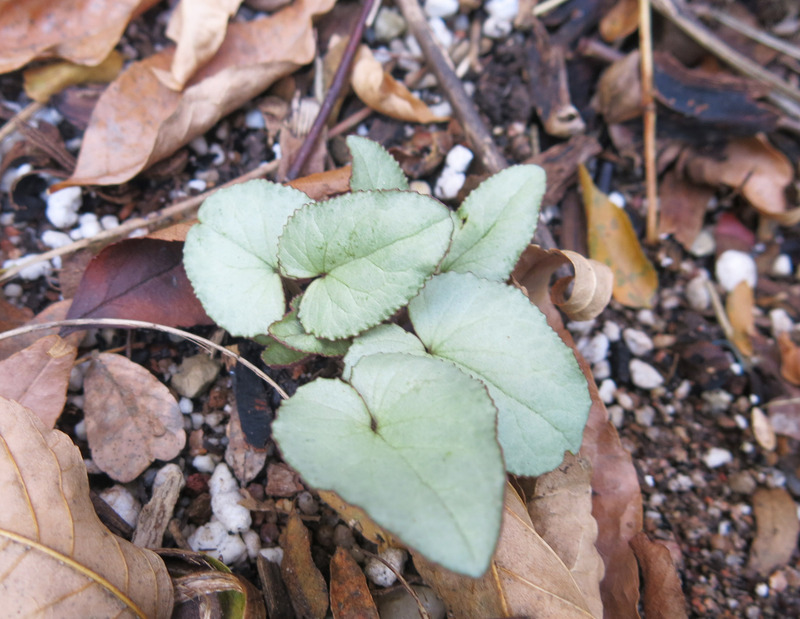 Even though it was my first Halloween, and I was scared, the guy I live with reminded me that this is a gardening blog, sort of, and there are exciting things happening. 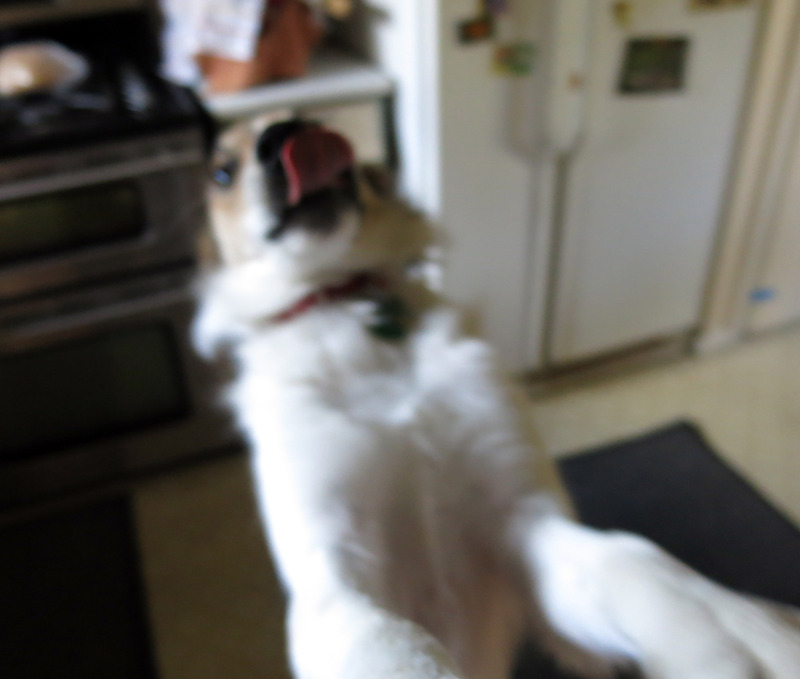 I imagine you might like to see some pictures that are actually in focus now. 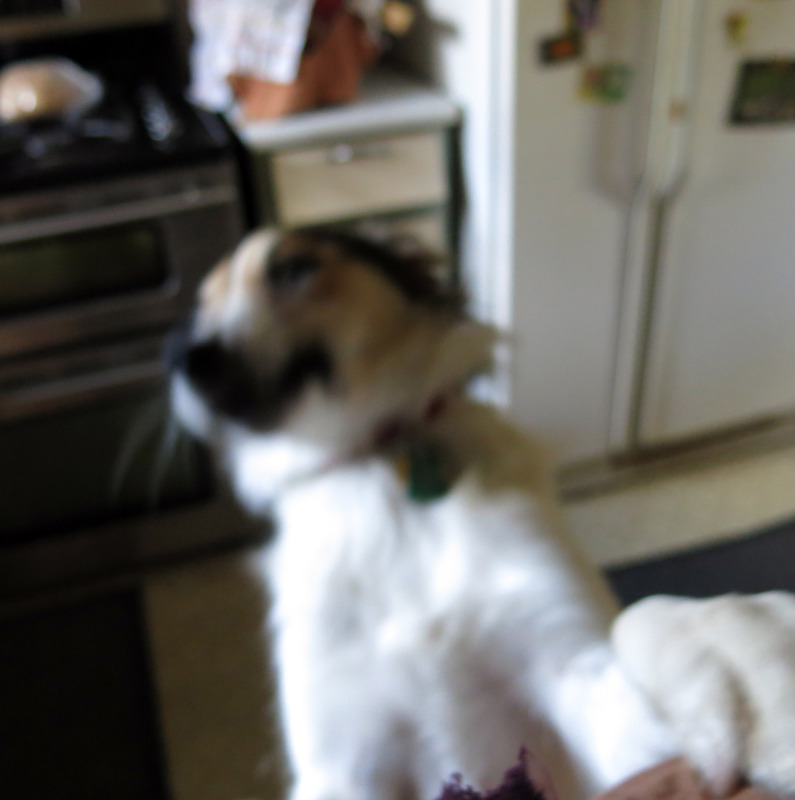 (Mostly in focus, anyway.) 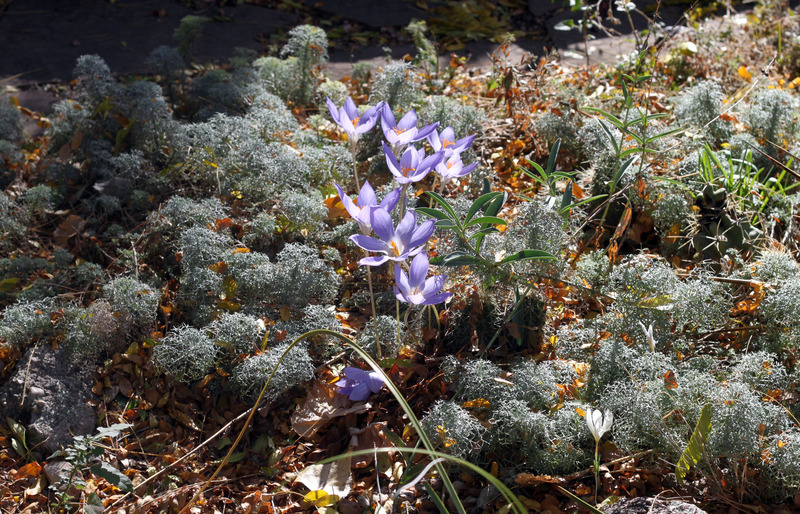 Here’s a picture of the Crocus speciosus growing in the ‘Seafoam’ artemisia. Same crocuses I showed a couple of days ago. 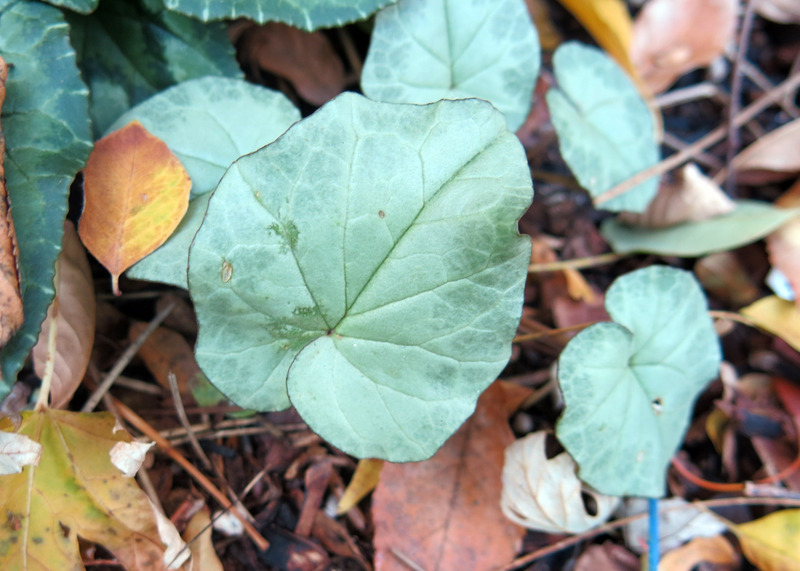 And I guess another big deal is cyclamen leaves. 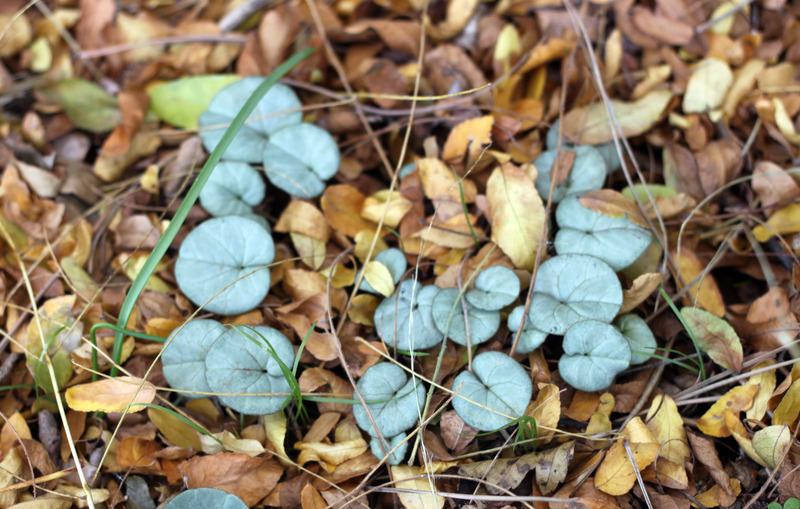 The first bunch are leaves of Cyclamen hederifolium. 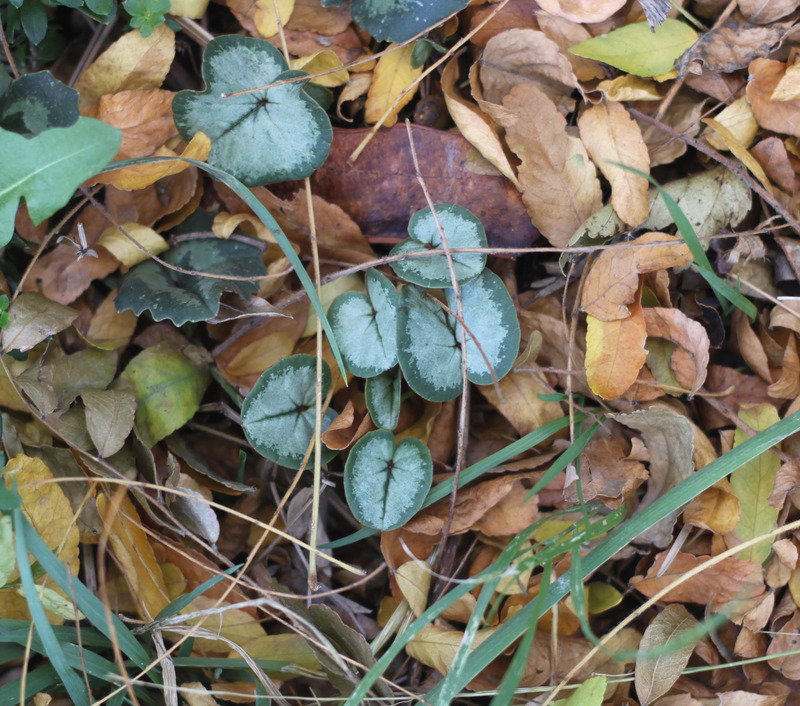 And here are some leaves of Cyclamen coum. 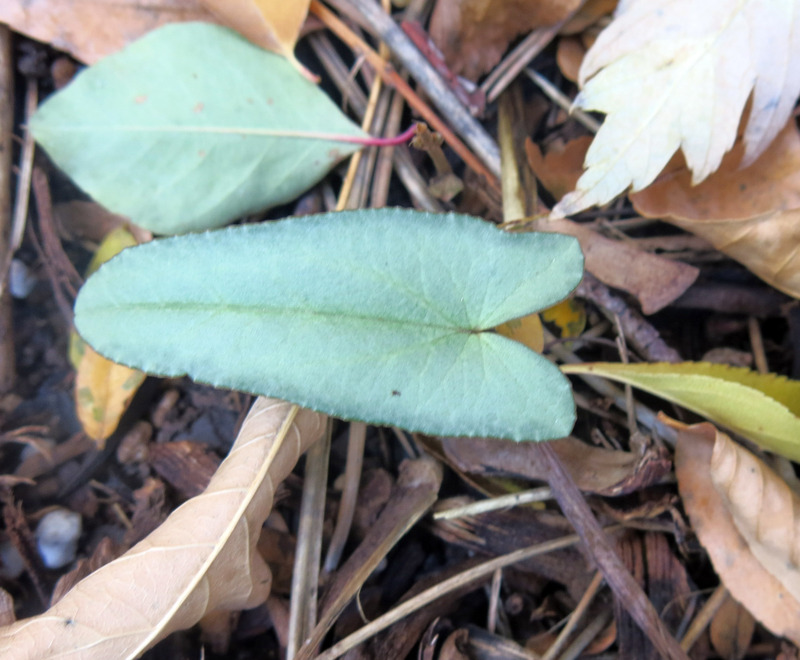 I guess gardeners think leaves are pretty excellent, in general. 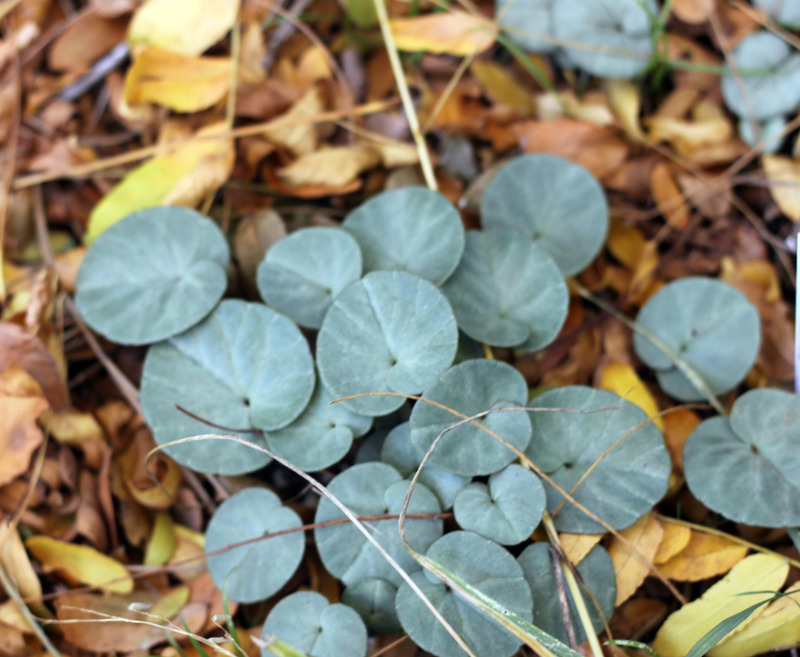 with some Cyclamen cilicium leaves, upper left. That’s about all I have for today. I just wanted to assure everyone that I was still here after an evening of terror and surprise. There were even firecrackers, for crying out loud. But I’m okay, and things are back to normal. 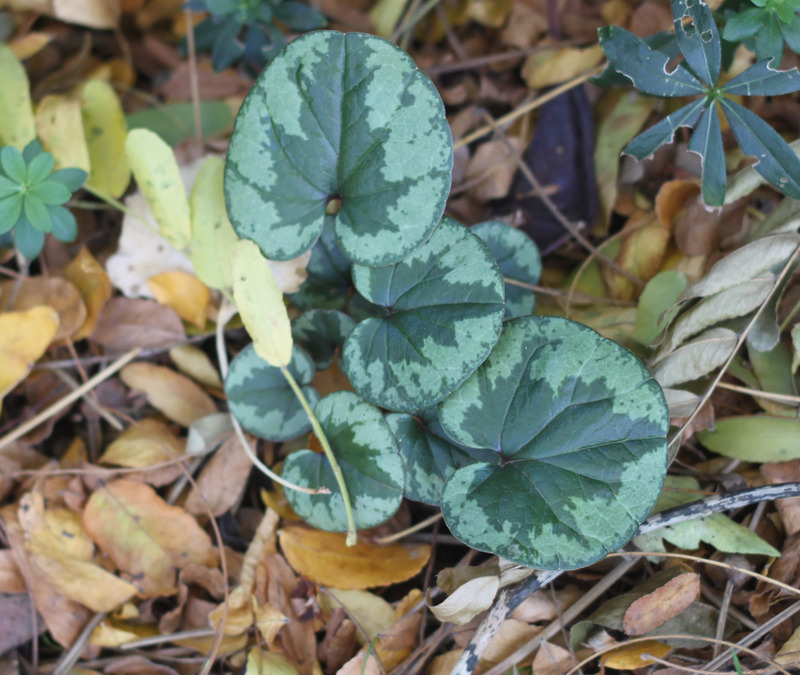 This entry was posted in Uncategorized and tagged Cyclamen coum, cyclamen hederifolium. Bookmark the permalink. 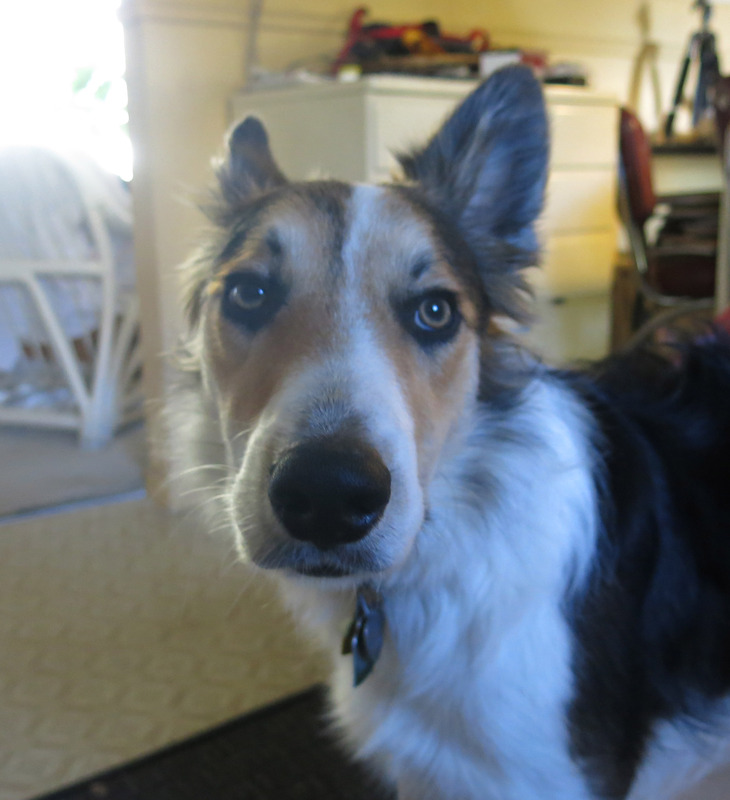 Hey, Halloween was my not-purebred border collie’s favorite holiday! Best chance to greet the kids in the neighborhood. Maybe it’ll grow on you. Fireworks are a drag, though. I did get to meet the kids in the neighborhood, on my second day here. But not dressed up as skeletons, that’s for sure. Fireworks are a drag. The guy I live with said they were rare on Halloween, and I certainly hope so. Short people who are hopped up on sugar AND wearing masks. Very frightening. We have no sidewalks here so all the kids go to the heavily decorated subdivision behind us. No room in the budget for candy anyway with all the plant buying. You must have a special variety of C. hederiflolium to get those fancy silver leaves, right? 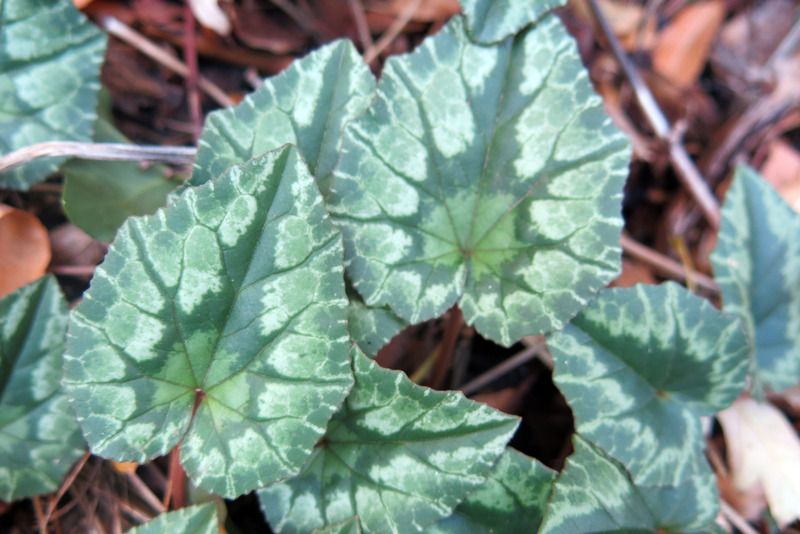 I just have ordinary leaves but I don’t think there is much prettier than a cyclamen leaf. 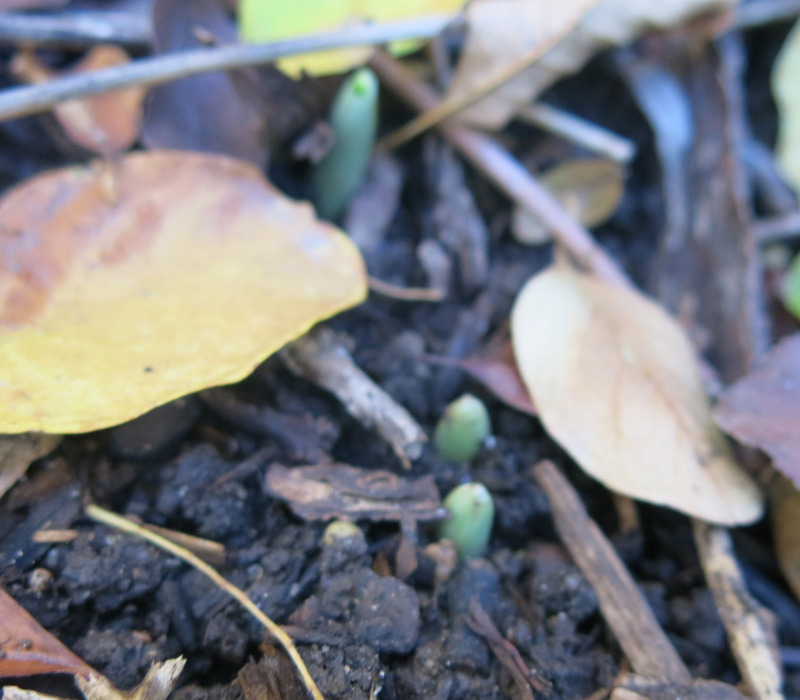 Speaking of ordinary, I planted some snowdrops of the usual varieties in September, should I be seeing them? I’ve never grown a snowdrop. I can’t wait. November and December are hard, very gloomy around here, but I know you are excited about the cold weather. You look very coy in the last picture. Thanks; I was trying to look coy. They say it’s supposed to snow a bit later this week and I can hardly wait. I understand that the snowdrops that are coming up are special, snobby type ones, but in this case they were given to him by a friend, years ago. Regular snowdrops appear here about the third week in January, and the display goes on until mid-March. I heard a little about snowdrops when I first showed up here. They don’t look like much, but the guy I live with pointed out that the flower when it’s winter, and so that makes them special. 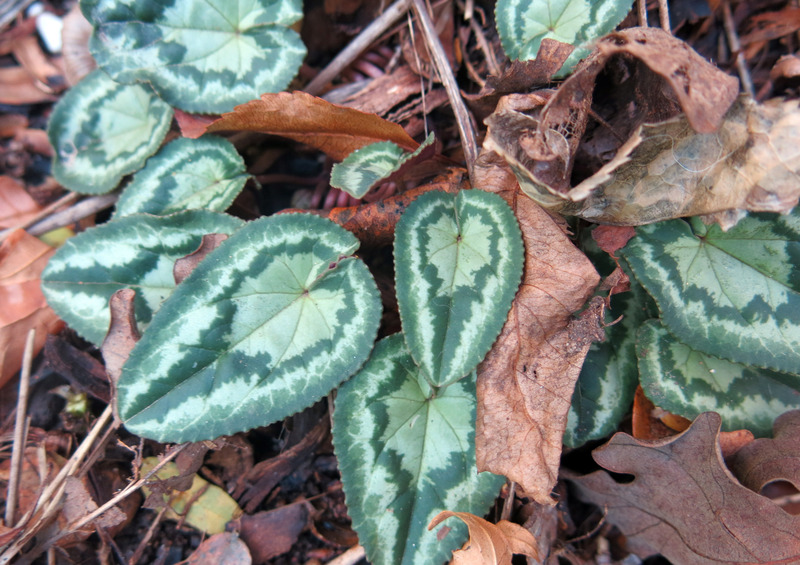 Yes, the cyclamen hederifolium and coum are special ones. There are places where you can get them, the silvery ones, like Edelweiss Perennials, though some also appeared here, just by seeding (the coum, I mean). 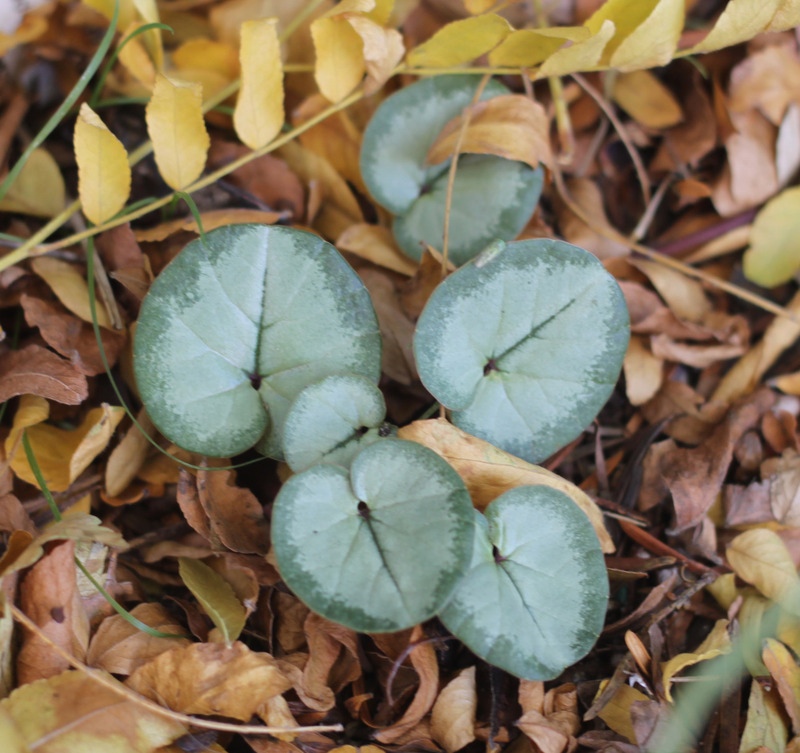 A very good friend of the guy I live with gave him a bunch of Cyclamen coum years and years ago and they have multiplied. Sure. The guy I live with has been very happy with their plants. I guess there was a visitor here from Corvallis (he’s been there; I heard a story of redwoods in the fog, but I don’t know what fog is) who said they couldn’t grow Gentiana acaulis either, so not to feel bad. The guy I live with left me for a few minutes today to try to give away the bags of Kit Kats he bought, thinking there would be dozens of trick-or-treaters (I’m not allowed to have Kit Kats), and guess how many bags of unwanted Kit Kats he came back with? Zero, of course. I saw the heading and was hoping to see Mani in a bunny costume, or a vampire cape, or something. I LOVE seeing dogs dressed up…but then, I’m a cat person, so what do I know. 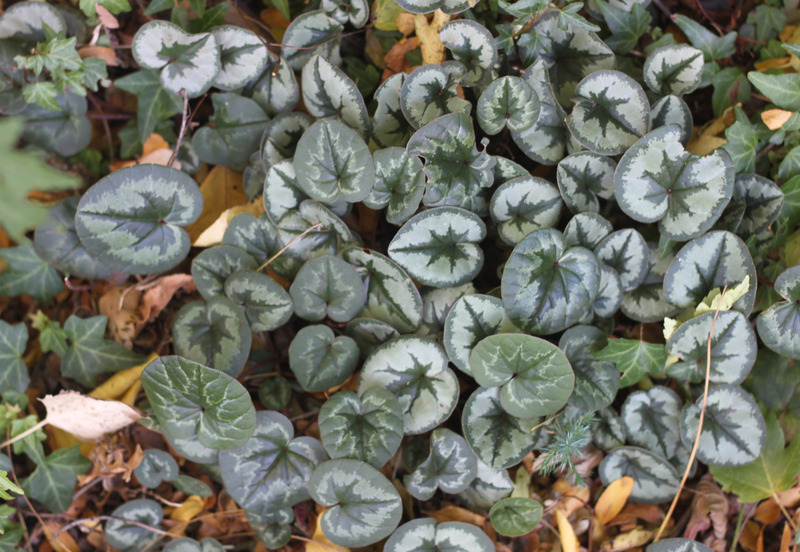 Those cyclamen leaves are delightful but it’s the sea foam artemisia that has me wishing I were a gardener. “Sea foam”, “artemisia”: so much poetry in so few syllables. Sea foam artemisia. What it kind of reminds the guy I live with of is the oak moss (or whatever) things, dyed green, that used to be used for model train sets, as trees and stuff, when he was little. (A very long time ago.) But, you know, all silvery instead. If the guy I live with dressed me up for Halloween I wouldn’t be able to post for months. I have my pride, you know. Oh, dear Halloween doggie, what a cutsie-pie you are. I am feeling cutsie-pie bereft because we took our own dogs to the kennel today where they will be safe while we attend the Heritage Rose Conference at the Texas Antique Rose Emporium. 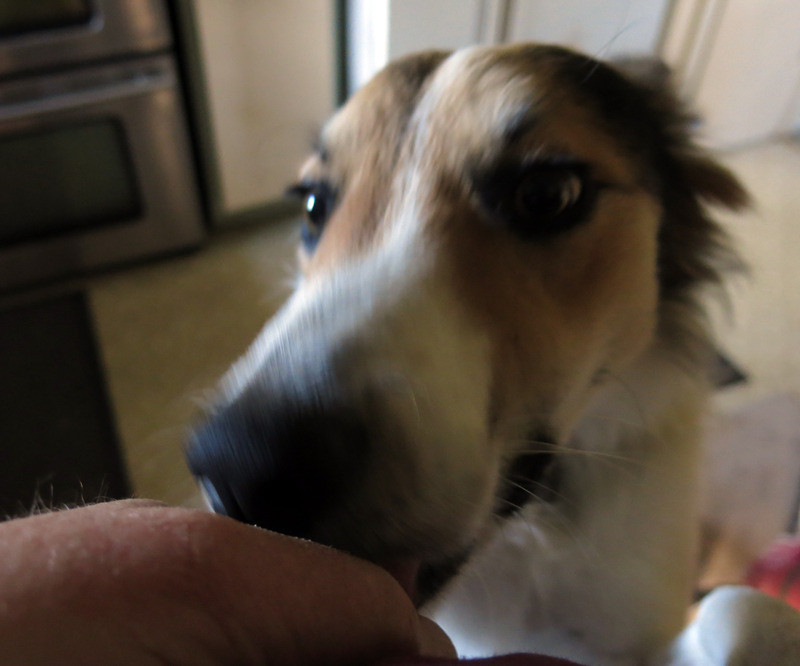 We will look around for pure-bred border collies, of course, but even if they show themselves they could possibly be as cute as you. The guy you live with is getting looser with the camera action where you are concerned, possibly because of your own loose action. 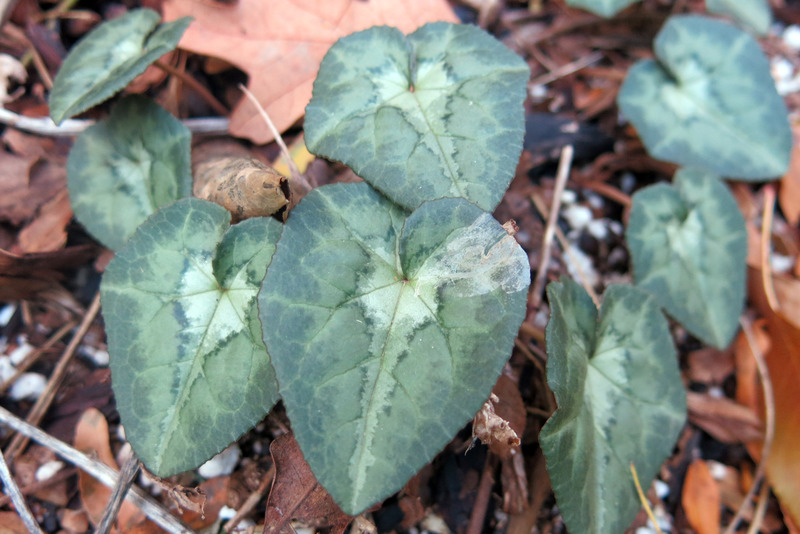 When it comes to the garden stuff, though, he’s all focused like with the crocus and variegated cyclamen leaves. Judging by the photos, they should be focused on. I do have some of that sea foam artemisia. Good stuff. Looks like sea foam as it breaks on the sand. Thanks. I agree that I’m pretty cute. The guy I live with has heard about Antique Rose Emporium, and for many years now. NOT possibly. 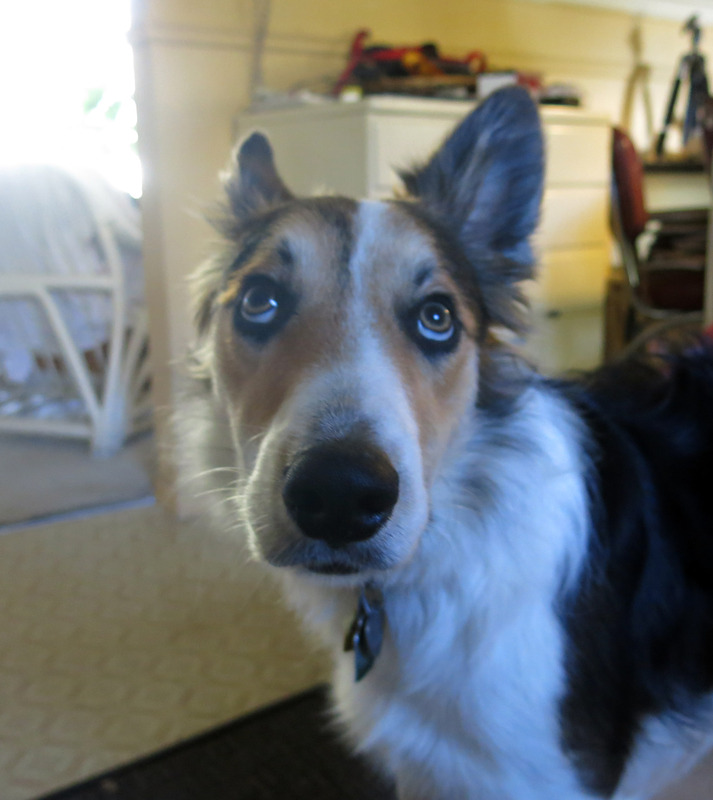 Those other border collies, they could NOT possibly be cuter than you. Which of course you know. I kind of do know. 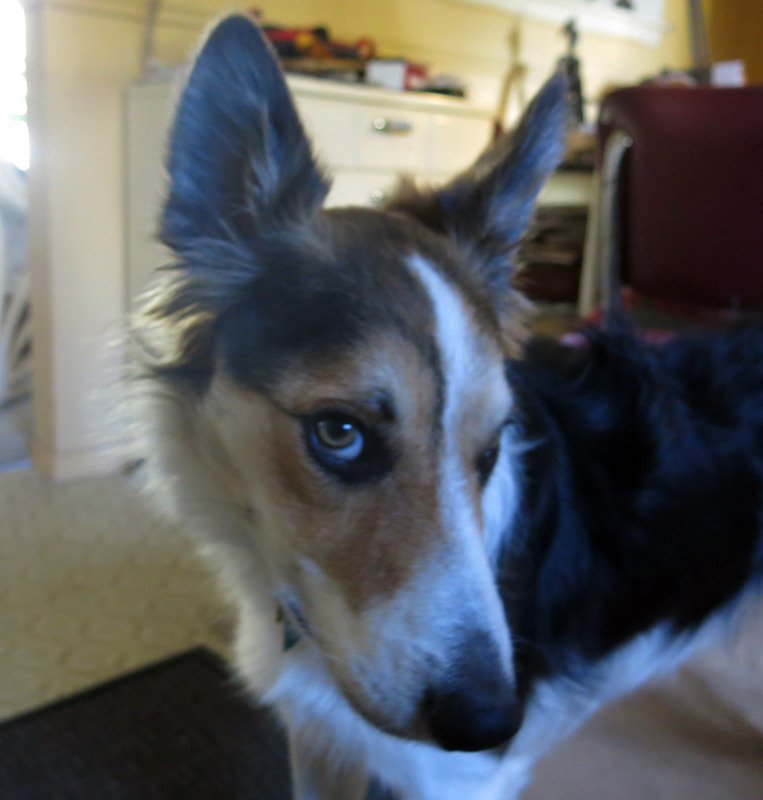 Mostly because of the eyeliner business, and what the guy I live with calls my “radar ears”. It’s true that I can hear a lot with them. Wow. So hederifolium. Much cyclamen. Yes; the guy I live with is really into cyclamen, though, he says, not as much as he wishes he could be.